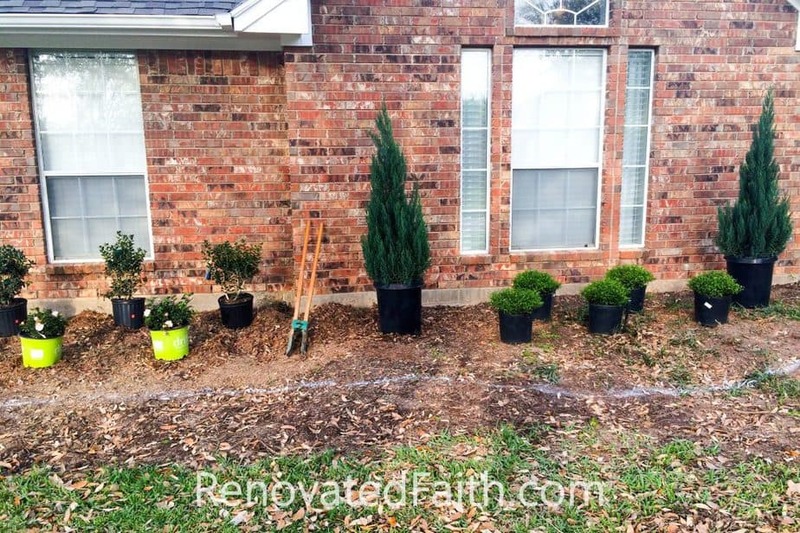 Want to redo your yard but don’t know where to begin? Don’t start your DIY landscape design without these simple front yard landscaping ideas on a budget! 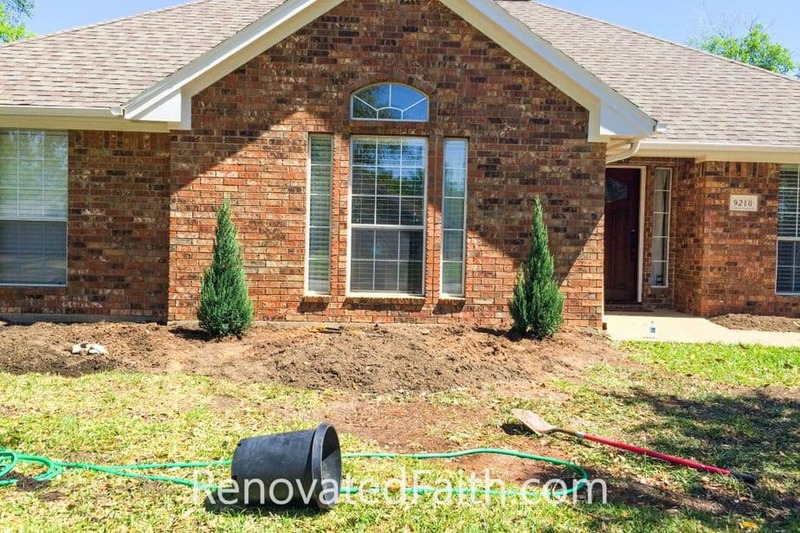 Upon moving into our house, I knew that we would have to take serious steps to add curb appeal to our new home. Our front and backyard were in such a bad state that I think they are the only reason we got the house for a good price in a really competitive market. No one wanted to deal with the yard but me! The landscaping was messy, overgrown, impractical and not our style. So, first I got a few bids from local landscapers. Unfortunately, they were either really expensive or didn’t seem very knowledgeable. For example, any Texas landscaper worth his salt knows that Knockout Roses need a lot of sun. When I looked at one landscape design with them in a super shady spot of the yard, I realized maybe I should take this landscape design into my own hands! It was then I implemented my own budget-friendly landscaping plan. 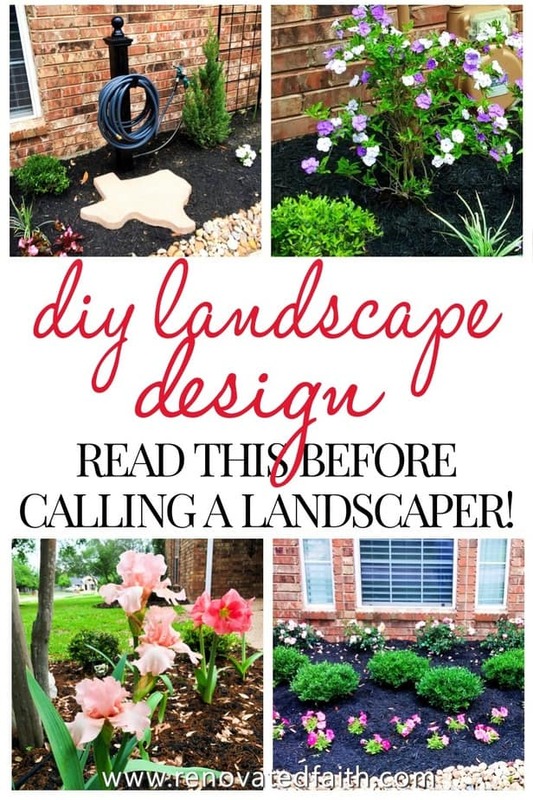 Wondering how to do DIY Landscaping on Your Own? If you are wondering if this is something you should take on yourself, it’s not nearly as daunting as you think. In fact, you probably have a better idea of what you want than you realize. 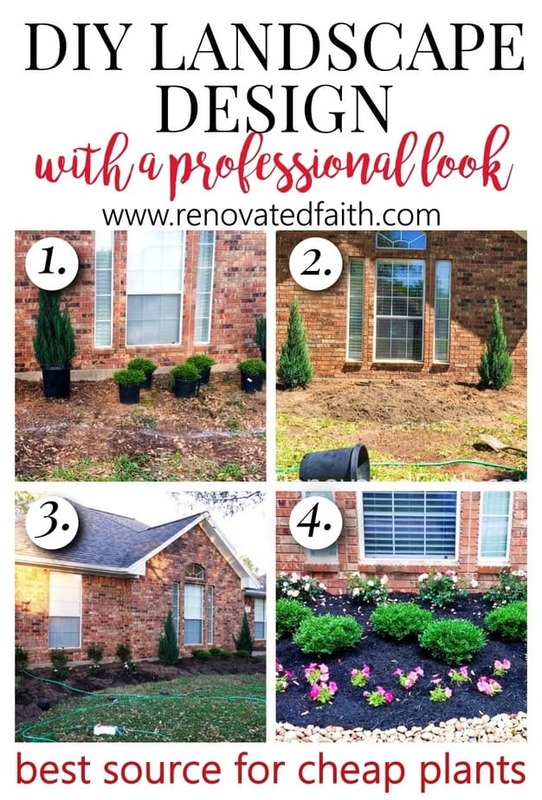 With unlimited ideas online, these simple steps show you to find the right plants for your area to make your front yard makeover a reality. Planning your own landscape design can be overwhelming but these simple front yard landscaping ideas will give your yard a professional look while staying on budget. 1. DIY Landscape Design for Beginners – Don’t Be Afraid to Demo!!! 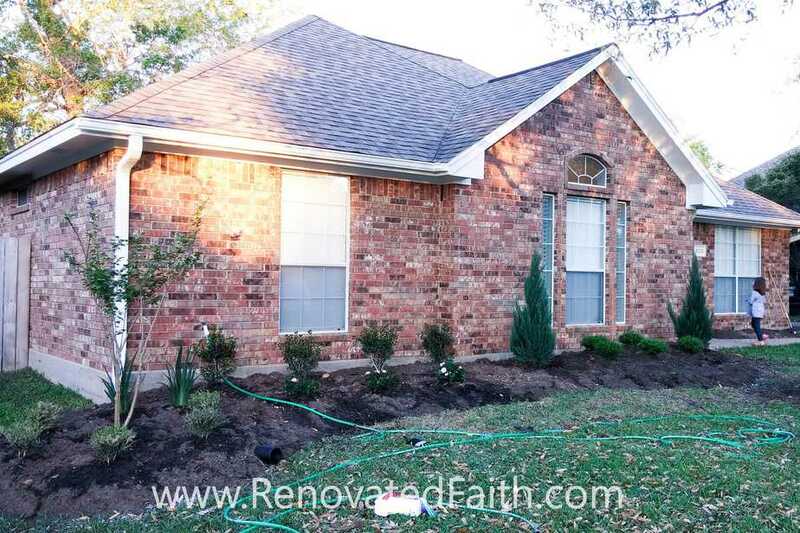 This was a project that had to be tackled in several steps as we had to clear out all the underbrush and small trees (except just one crape myrtle) in the front yard. None of the small trees were in good shape and were in an odd location, right in front of the view of the front door. The function of landscaping is to complement your home, making it open and inviting. 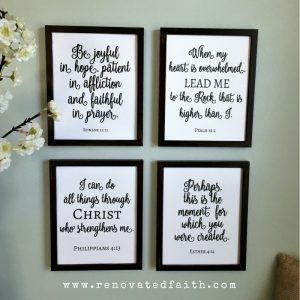 If any aspect overwhelms or distracts from your home, it has to go! Notice how much more light comes in by losing the small trees. 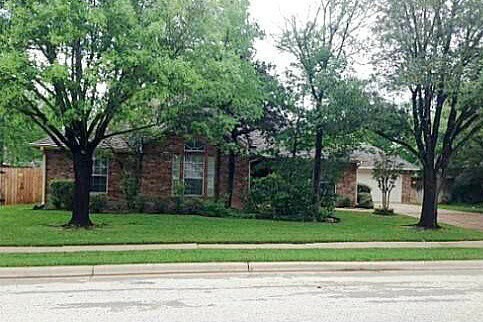 Below is the before picture and you can see in the next picture that so much more light comes in with removing the small scraggly trees. Next, and I cannot emphasize this enough, make sure to get every aspect of your plan on paper. It is so much easier to make changes on paper than it is to move plants already in the ground. Remember to take your time on this step. It’s so much easier to erase part of your design than pull plants out of the ground! 3. Easy Front Yard Landscape Design – Make a Plan! Adding contrasting elements to your DIY landscape design can make your yard more visually appealing. Since the walkway and face of our house includes lots of straight lines and sharp, right angles, I knew I wanted to make our beds curvy to add more interest. You don’t need to know what varieties of plants you use in your landscape design at this point. You just want to have an idea of the general shape and size. Use large plants in the back and smaller plants up front. As you get plans on paper, think more about the shapes of plants (For example: tall and grassy vs. a small round shrub vs. Christmas tree shape) you would like for your plan than the particular plant types. Look for large voids against your house and fill those with tall shrubs, a small tree or a trellis with a vine. There were a couple times I changed my mind after using the spray paint, which was not a big deal. I just used my foot to wipe the old line out of the grass and sprayed a new line. If you are going to change your mind, now is the time! Now, research the plants that would work best for your landscape design and region. My best advice is to use plants that you already see thriving in your area as you know these will be a wise addition to your landscape. 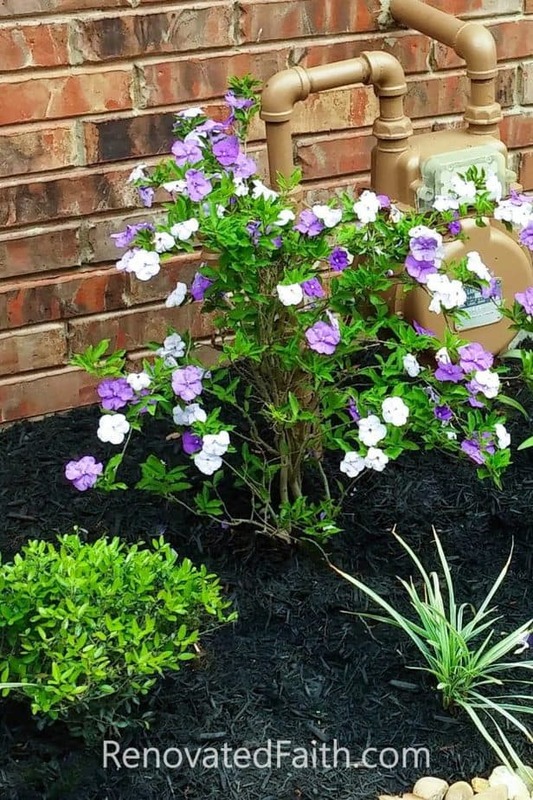 For example, in College Station, we have very high pH so that limits our landscaping to a degree because plants like azaleas and gardenias like a low pH. Also, we don’t have the best soil. So while we are limited, it’s still not impossible to have beautiful landscape plants. Be sure to take note of the size your plants will reach at maturity or know that you can prune them back if you need to. For example, I used several Dwarf Yaupon, (shown above) which can become small trees if you let them just grow, but my plan is to prune them every year to keep them small and round. Pick trees that will not grow too large or just make sure to put them far enough away from the house. The crepe myrtle I picked is a smaller-growing variety. Also, email your local extension office for questions about plants. They are happy to answer specific questions and often times they have a list of what plants do well in your location. Avoid planting a large plant or tree directly in front of the vertical lines of either side of your house as covering these lines of delineation will make your home look smaller. Notice the new crepe myrtle tree’s trunk is to the left of the house. Also avoid covering windows or borders of windows because seeing these lines of delineation will make your home look bigger. Always put smaller growing shrubs or grasses in front of low windows. Don’t cover them with tall shrubs. You can also plant shrubs at the edges of the yard in order to obscure boundary lines. When others don’t see a hard boundary line, the yard looks bigger. Planting vines on fences or trellises near your home also soften boundary lines. Last, don’t overcrowd plants. Plan your DIY landscape design so there is plenty of space between each shrub in your flower bed. Click here for more tips on making your home look bigger with landscaping. The big box stores can be great for finding cheap plants but in ours, only about 1/3 of the plants they sell will actually grow in our alkaline soil. Big box stores don’t take a lot of care to pick plants that will do well in each store’s region and their associates are often less than knowledgeable about how to care for them. In terms of plant knowledge, private nurseries in your area will only sell plants that will grow in your particular area and zone. However, there is an even better option for finding cheap landscaping plants. I googled nurseries in our area and stumbled upon a wholesale landscaping company called Site One that also sells to the public. I kid you not, their plants are half the price of plants anywhere else because you are buying them at the same cost local landscapers pay. Also, they ONLY sell plants that do well in the area! It had by far the best selection of plants that all grow in our area for a fraction of the cost. 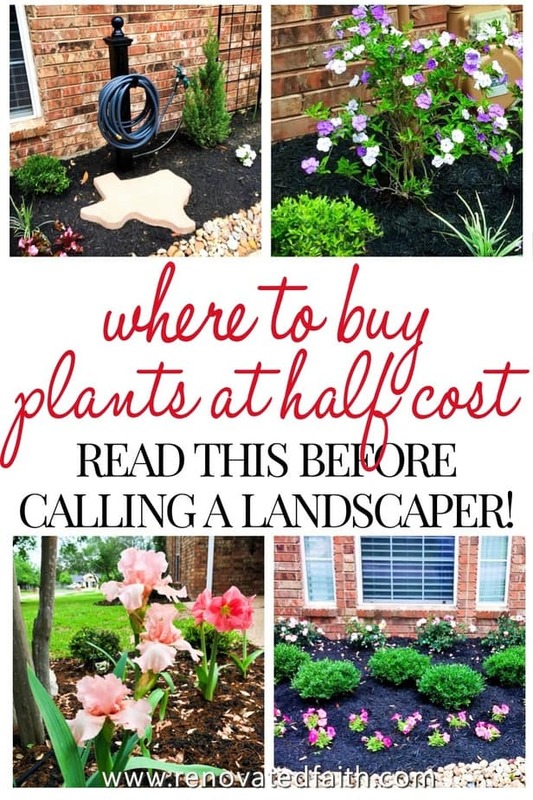 By using this source, I was actually able to buy the exact same plants that would have been three times the price a landscaper was going to charge me. To find the Site One closest to you, click here! Use lots of color to add curb appeal! Also, think about what colors coordinate with one another. Maximize your opportunities for color by using flowering shrubs such as azaleas and rhododendrons, which come in a wide variety of colors and sizes. These are good background plants because they flower most of the year, and can be pruned into a rounded shape or a hedge. If you have a special plant in mind that won’t work in your area, there are always alternatives. For example, I love azaleas but since those don’t grow here a close second for me are Drift Roses that I will keep pruned back because they will grow just about anywhere with very little maintenance. Drift roses are very disease resistant, heat resistant roses that are a cross between a miniature rose and a ground cover rose. (Click HERE to see different varieties.) 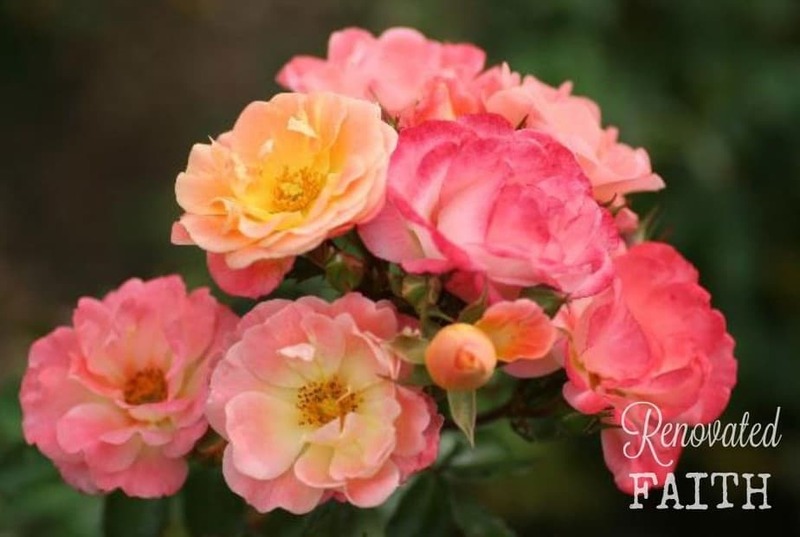 The Peach Drift Rose is also more shade resistant and will bloom most of the year. Aren’t the color combinations amazing?!? 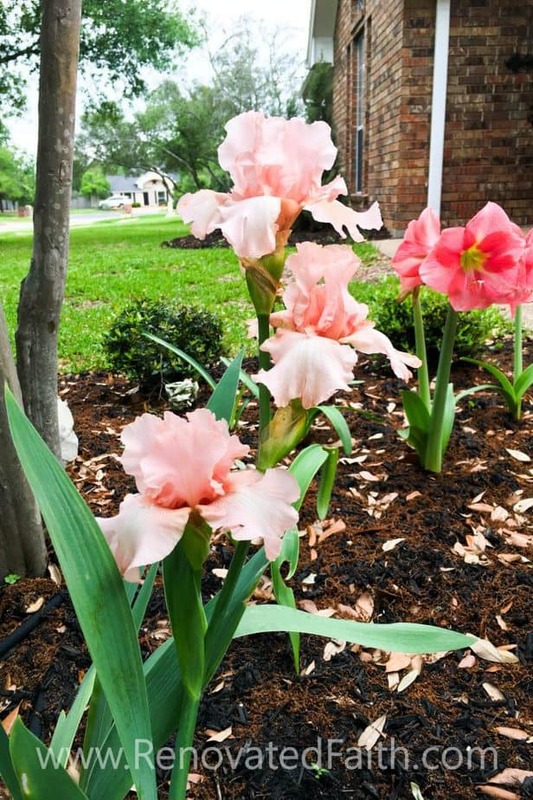 It’s now time to prep your flower bed! Once I brought all my plants home, I then spaced them all out exactly how I wanted them and took pictures with my phone to refer back to when I was time to plant. We literally dumped the soil on top of the grass as we knew our beds were high enough that the grass would never be able to grow through. Buy dirt by the bulk and have it delivered as it is much cheaper than buying bags. We used the remaining dirt to fill holes in the backyard. Once Jeremy and I added the soil to the beds, I began to plant. Start with the biggest plants first and be sure to ask for help with planting large plants, unlike I did. Then, plant from the back to the front, taking care to step in the bed as little as possible to keep the soil loose as plant roots don’t like soil that has been packed down. I like to dig all of the holes first and then go through and set the root ball of each plant in the hole. Before covering each plant with dirt, I stand back and look at all the plants and their heights in the holes. Now is the time to make any adjustments as far as spacing and hole depth. When you get everything adjusted just how you like it, it’s time to refill the holes with dirt around the new plants. Water the plants very well after they are planted. You can see below that everything is planted in the soil and watered in well! Be sure to moisten soil in the entire bed. Once you add the mulch, it will help the bed retain moisture. Like I mentioned in my post 27 Tips for Selling Your House Fast, curb appeal is such an important aspect to adding value to your home. You can never take back a first impression so it’s worthwhile to add extra touches. After running these soaker hoses and fertilizing with Osmocote slow-release fertilizer, I added a few extras of my own for extra curb appeal before mulching! First, was the stone bird bath. It was actually left by the former owners in the backyard. It had chipped paint and had definitely seen better days. I sprayed it with a Clorox/water solution and scraped the paint that was peeling with a wire brush. Then I let it dry out in our garage for at least a week. When it was dried out, I sprayed it with Rustoleum Universal Flat Soft Iron. I’m really happy with how it turned out! As I mentioned, I knew I needed to fill the mass of blank space on the side of the house. I bought three trellises from Lowe’s and just attached them with lots of black cable ties – easy peasy! I liked the look of the two end pieces being lower in a more cathedral look, so that’s how I attached them to one another and then just buried the bottom of the two side trellises deeper. 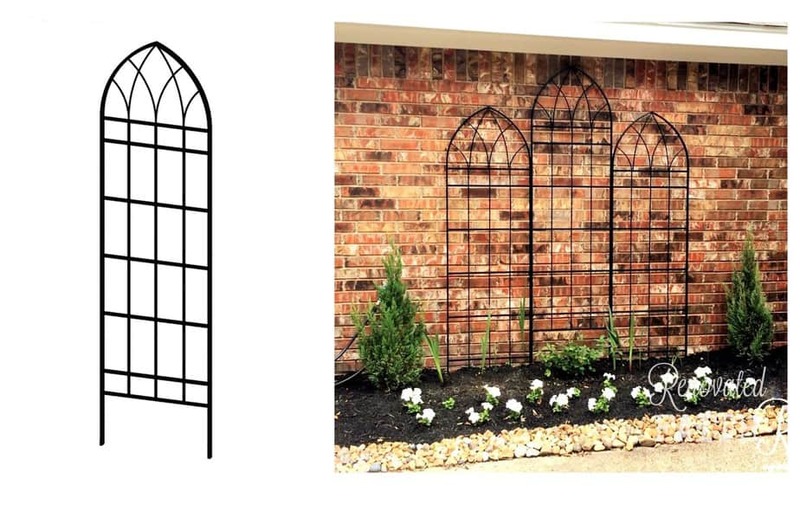 This plan was MUCH cheaper than buying one large 6-foot-wide trellis. Update: Two years later that little climbing rose has completely covered the 6 foot trellis. I will be sure to add a pic when it’s in bloom! I also made a garden hose holder with some simple supplies from my local home improvement store. I figure if you can’t hide something that is ugly, you might as well make it cute! I bought the finial and post cap from Home Depot and bought the hose hanger here. After spray painting it with Rustoleum Black Semigloss, I buried it two feet, added a hose and voila! 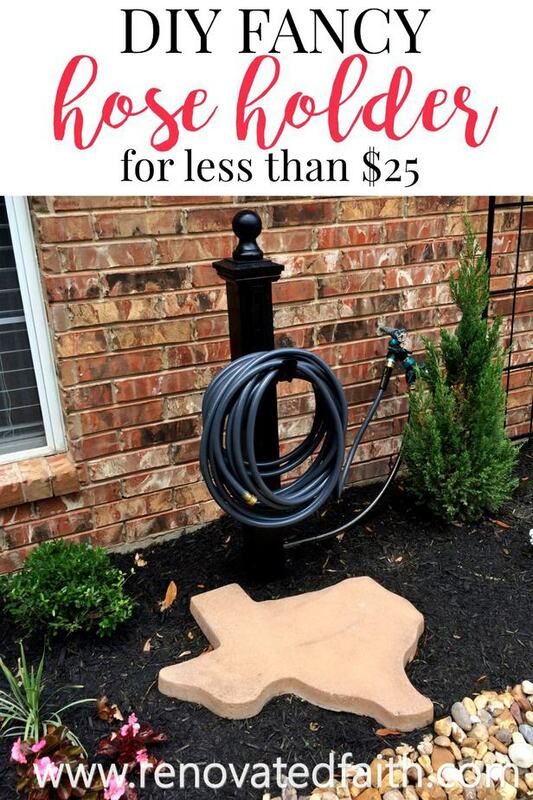 The whole hose holder cost $26.00. Also, you can make a hydrangea wreath like this one by clicking here: Hydrangea wreath tutorial. 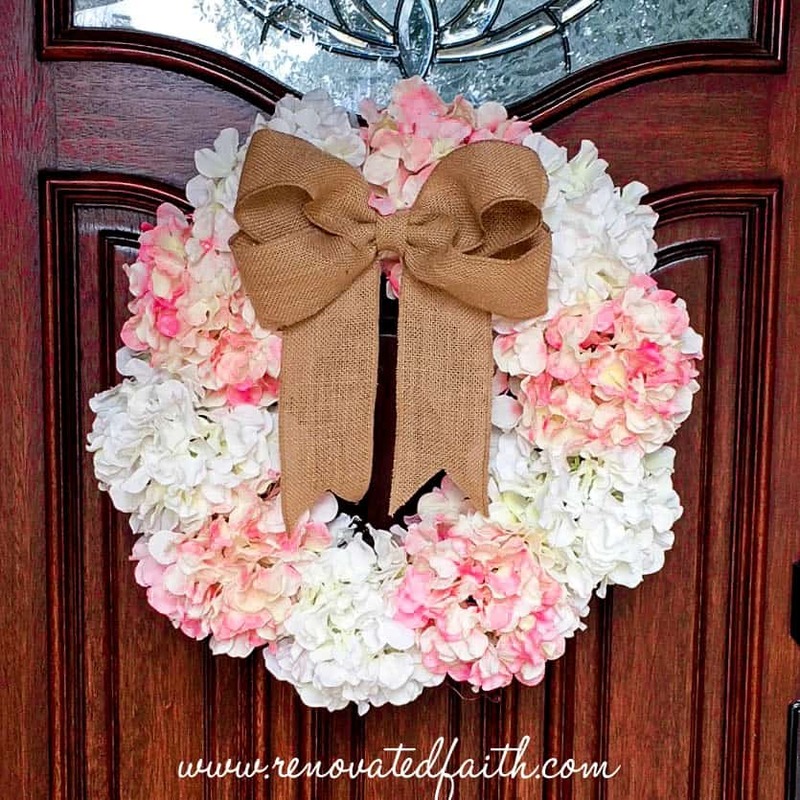 It includes instructions where you can customize any color and size of hydrangea wreath for your front door. I had to share with you my hummingbird feeder. 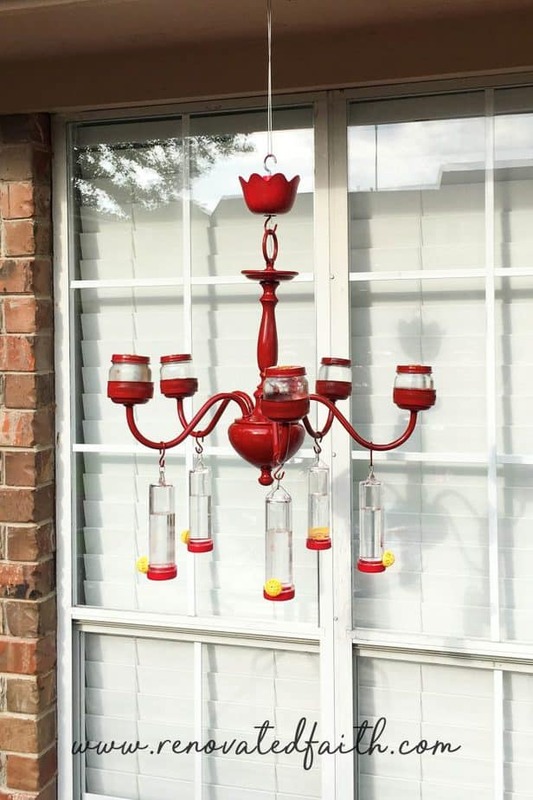 Not only is it a cute way to makeover an old chandelier but it’s also a great method of attracting a large number of hummingbirds to your yard at once. Between your flowering shrubs and bulbs and this feeder, your yard will be a hummingbird heaven. Click here to read more about how to make your own: DIY Hummingbird Feeder from a Chandelier. Next I added a thick layer of newspaper over the soaker hoses. Newspaper is great for controlling weeds as it smothers existing weeds and prevents weed seeds from germinating. It also helps the bed to retain moisture and attracts worms which is great for the soil. Add a thick layer of newspaper (two or three are better) and wet it down to prevent the wind from blowing it away. Then add two to three inches of black mulch. I like the black mulch because it adds a nice contrast against the house and bedding plants. Adding newspaper is definitely worth the extra step and its free! It will save you a massive amount of time later on when you don’t have to weed! Trust me on this! We had help with the mulch and rocks because of a service project at Texas A&M University called Big Event. A group from the American Childhood Cancer Association at Texas A&M covered our beds with mulch and meticulously placed the stones along the flower bed edges. We are so thankful for their hard work and attention to detail! This video allows you do implement an easy no dig border in your landscape design plan as the rocks do. Check it out to see which one you prefer! What do you think? 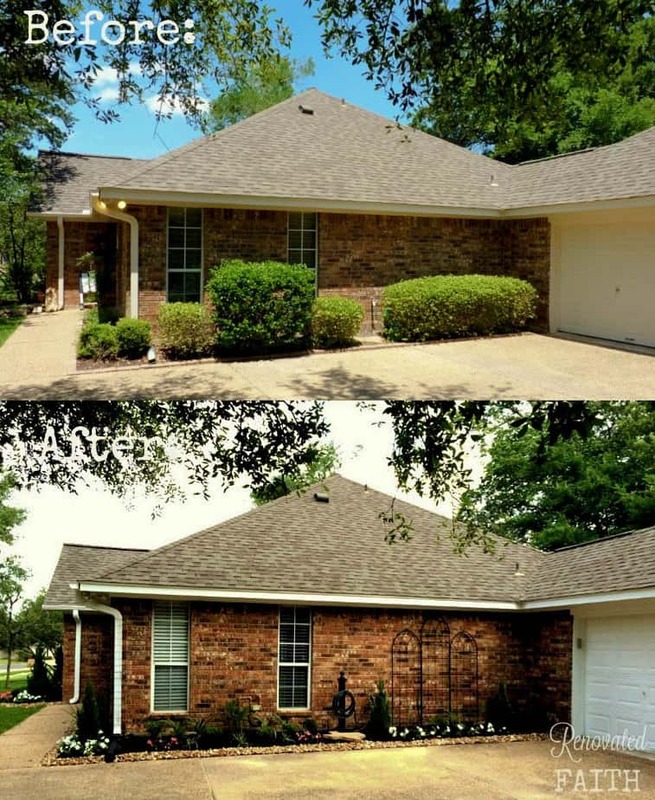 It’s hard to believe the difference that a good landscaping plan can make. 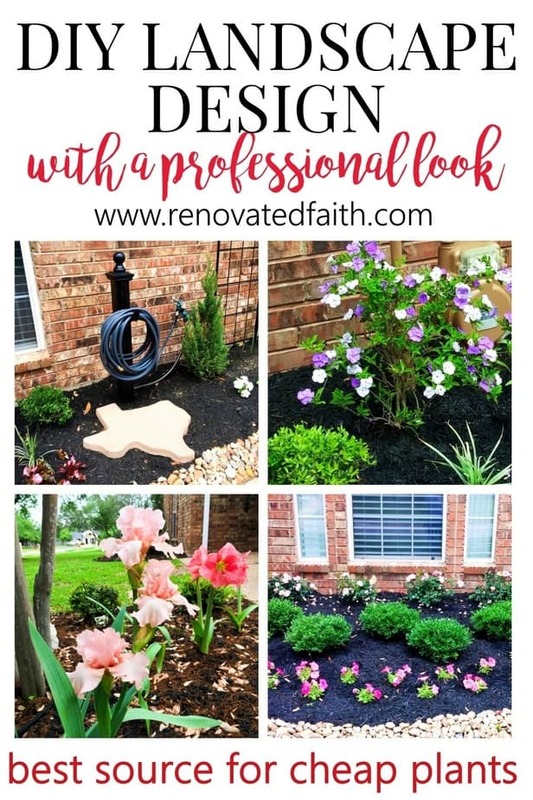 But you don’t have to be a professional to have gorgeous curb appeal on a budget. With these steps and a good landscaping supplier to buy plants at cost, you yard can be landscaped in one weekend without breaking the bank. Now it’s your turn! When you are done, I’d love to see how it turned out! So, be sure to post your before and after photos here! My favorite aspect of this project is one particular plant called a Yesterday, Today, Tomorrow plant. I needed something to cover the gas meter, which I had painted to match our brick. It’s not a very common plant, but it is special to me because my grandmother had one in her own garden. What’s unique about this plant is that once it blooms, the flowers are deep purple the first day, lavender the next day and then fade to white the third day. She was careful to explain to me that the plant signifies the three days that it took for Christ to rise from the grave after he died on the cross. The darkness of the purple represents the depth of our sin but then by the last day the white flower signifies the purification, forgiveness and new life that can only come from Jesus’ death and resurrection. When we accept this act of unselfish love, we can enjoy eternal life with Him. Above is my Yesterday, Today, Tomorrow plant which is a beautiful shrub that flowers almost year round. 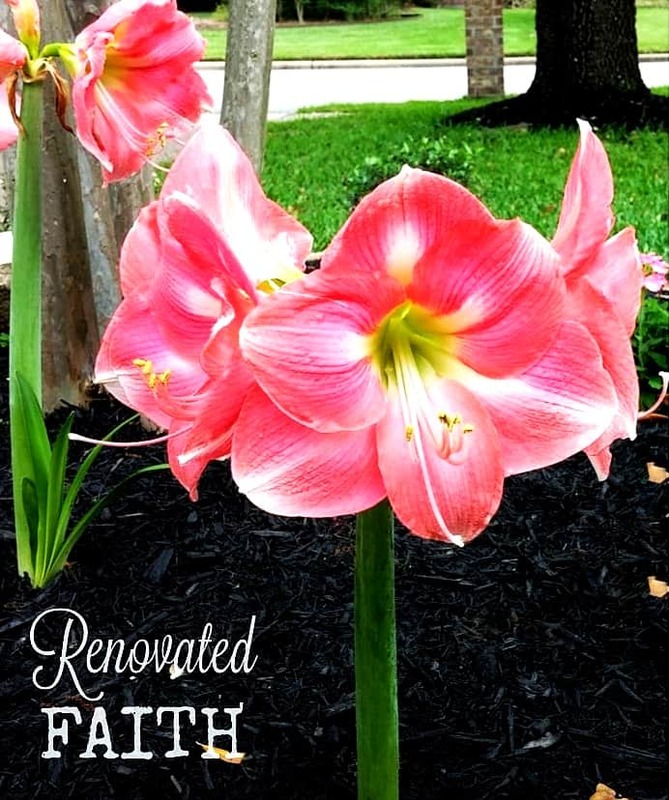 It’s my favorite plant in our yard and a beautiful reminder of the legacy of faith she left for our family. 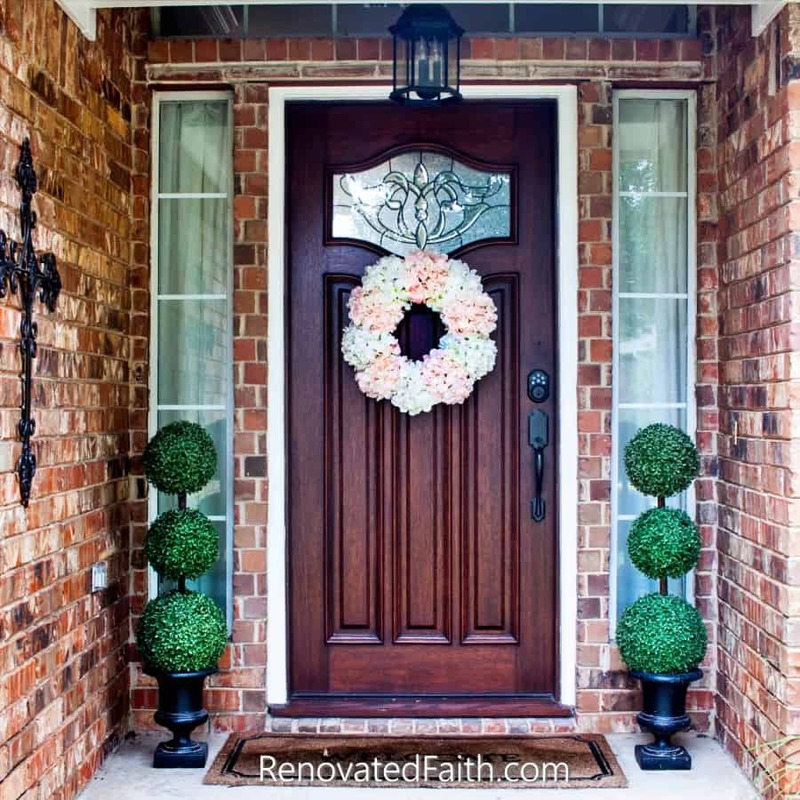 Be sure to check out my other posts to update your curb appeal HERE. My grandmother had a green thumb and everything she touched would bloom and thrive. I think she would have been pleased with my new flower beds. Hopefully with these tips, you will have an amazing yard you can be proud of . Fortunately, I’ve found that with a good plan and the right plants a green thumb is not hard to come by! 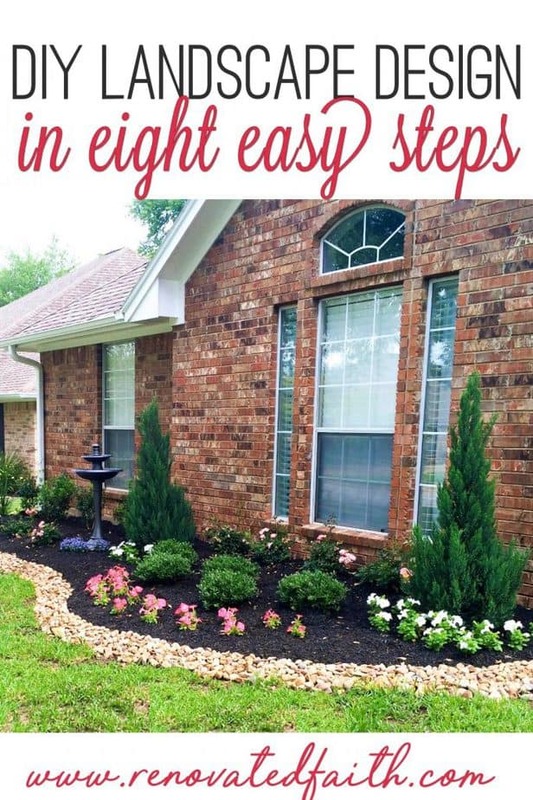 Anyone can have amazing curb appeal without having to spend a lot on landscaping by implementing these easy steps. The landscaping you did looks fabulous! I also like your helpful hints on how to plan and execute it all. I had to let you know, because it is most important, that you wrote Jesus hung on the cross 3 days. He hung on the cross 6 hours. A helpful sight that biblically answers and explains bible questions is, “Got Questions? “, and type, “How long was Jesus on the cross? “. It explains the Jewish and the Roman way of keeping time that is referred to in God’s Word… and both ways point to 6 hours being how long Jesus hung on the cross. That being said, I also love your hummingbird chandelier feeder and front door topiaries! This is a great inspirational blog and thank you for your sharing! Thank you SO much for catching that. I meant to say that he arose in three days. I appreciate your sweet comments and thanks for visiting my post. Thank you so much!. I am new to Texas and live west of Fort Worth in Granbury, but this helps a ton!! 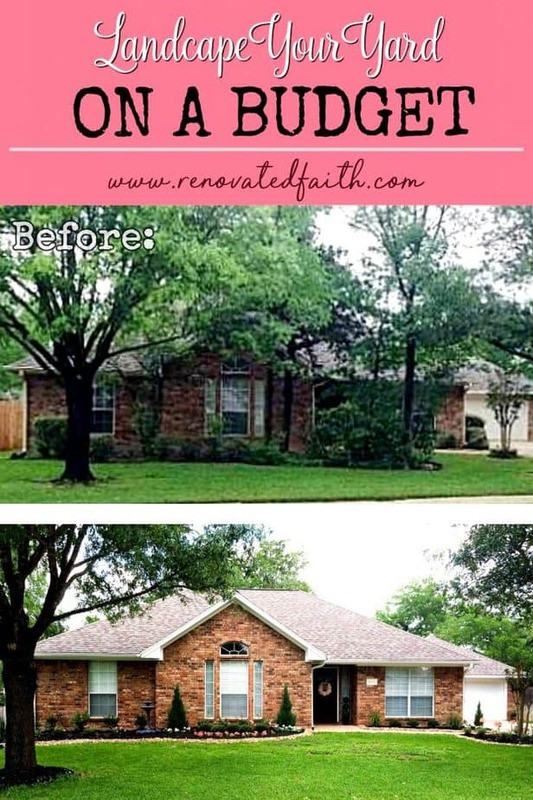 Love what you have done.. We have a brown brick and stone ranch and trying to figure out what to add to the front of the house to give it depth and curb appeal.. Need to break up the browns!! You are kidding. My husband used to oversee some projects in Granbury. That is such a nice area! I understand what you mean by breaking up the browns. Good luck with your landscape design! Beautiful and inspirational!!! Thank you for sharing.! Thank you Mallorie! Have a great day!